I didn't watch the race. Seems that the biggest story was Ferrari team orders and them shooting themselves in the foot again. I predict a Albon Gasly swap mid season. RB would be stupid to do it. Max had a full season at TR before being swapped during the next season and look what the demotion did to torpedo. RB need TR drivers to keep pushing the development of the Honda PU, not moping around at the back of the field feeling pity for themselves. If they promoted Albon they have no one else so Gasly would have to go down to TR. Plus RB know their chassis has issues and Gasly has been improving each weekend. No way Albon is moved up this year. Let's review a minute. AUS - Team fucked Gasly on a track that is hard to pass BAH - Team has the car setup error. Yeah Max was amazing, but Max is suspected alien. CHI was the first weekend Gasly didn't have issues. Yeah he was well adrift of Max, but he was closer. He's never gonna be Max and he might not ever beat Max, but I think he'll be a good bit closer speed wise come the summer break. Albon is awesome and I can't wait to see him in the RB, but he did bin it in FP3 in a self described stupid mistake. He's going to continue to do stuff like that (needs to to find the limits) and RB is not the place to have that happen. 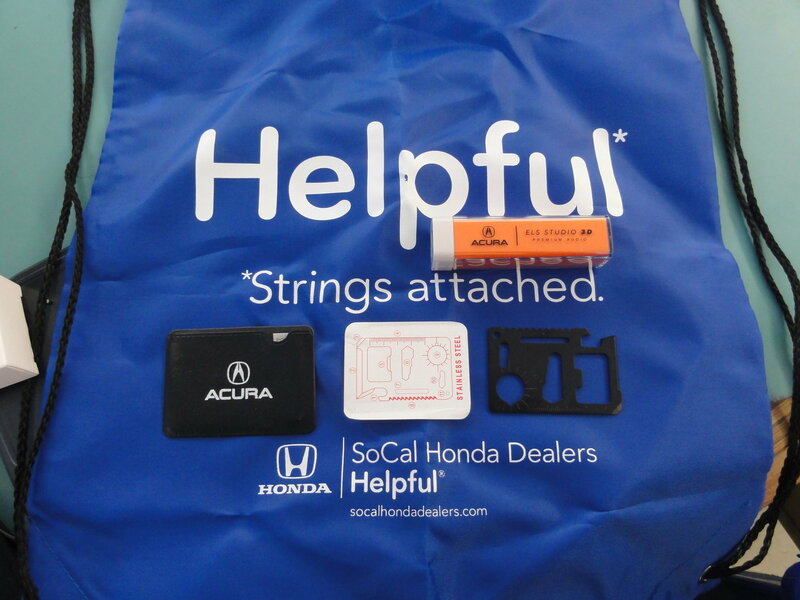 I got a free Honda drawstring backpack, an Acura pocket tool, and an Acura 2200mah power bank at Long Beach. Jared, I'm disappointed your mug isn't on that flyer! I'm sure you'll be busy and/or exhausted after sitting in the sun all day but hit me up if you want to cruise by, I'll probably be wrenching all day. It was super last minute and i ended up not even speaking. But it was pretty cool to sit in one and listen to smart people talk about the advancements in safety. I had a $15 beer, stuck around for for the IMSA race, then went home with a sunburn. Notice the offhand mention of when he writes a book? I hope he does. I bet it would be fascinating. Without going into too much detail, the simple answer is yes. Mercedes and Ferrari are the two biggest teams that have the most personnel. They also collect the most prize money at the end of the year. F1 is kind of the inverse of American sports, where the worst teams pick first in the draft. The better you do in F1, the more money you get paid. So the rich stay rich. I mean I get that they have the huge-est budgets and all that, but does that actually make their cars faster? Or do they just have better/more skilled drivers? Cars are faster. In F1, the cars matter more than the driver IMO, but obviously there are some that are just in a class above. The more money/resources you have the more ideas you can put to paper and test out. Also the teams with greater budgets can produce components quicker. You'll see lower budget teams start the season off relatively well but then fall back at the year goes on because they don't have the money to develop the car that the big teams do. Also, the big reason Mercedes and Ferrari are so dominant is that they are the factory teams for their respective engines. There are only four engine suppliers in F1. Renault and Honda are the other two. Renault has had a tough time sorting their engine out since the introduction of the hybrid-turbo rules in 2014, and Honda re-entered in 2015 after a 7 year absence. Both Renault and Honda are significantly down in power on Mercedes and Ferrari. In terms of drivers...a "great" driver can usually wring out another 0.25 - 0.5 seconds out of a car vs a mediocre one. When a car is 2-3 seconds a lap off the pace, the driver can't make up that difference. Lewis Hamilton is regarded as the best driver on the grid. Merc has also consistently been near faultless in terms of in-season development. Every time it has looked like someone was closing the gap with an upgrade Mercedes has had something that responds and then some within a month or so. Merc has been spending like mad, but the returns have been absolutely astonishing. And yeah, Lewis is the best on the grid. Merc also have what I consider to be the best strategists on the grid. Every now and then then **** up but usually their strategery is spot on. The stacked pitstop in China is a perfect example. Yeah, the crew had to do the work, but the strategists were confident they had the time. If they were off on their calculations BOT might not have finished P2. 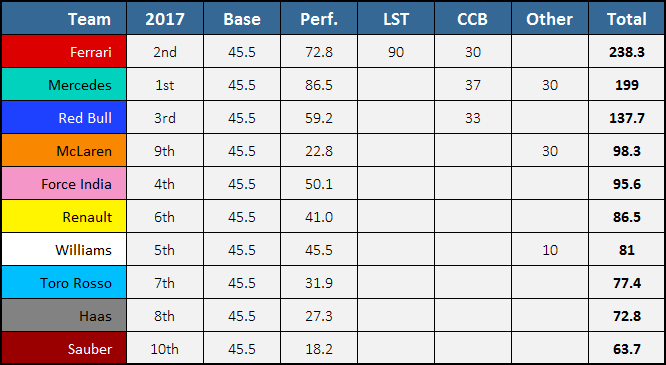 Merc just doesn't make many mistakes and they are good at updating through the season. Ferrari, for whatever reason, have not been able to do that. RB also tends to be really good at in season updates and it will be interesting to see if they can claw back some time. BTW rumor of Honda bringing gains of 2 tenths (roughly 20 hp) for Baku.